Axhilirit© HO Skin Enhancing Healing Oil has been traditionally used for broken skin, burns, acne, insect bites, stings and on other open blemishes and wounds. Popular with Adventurists, cooks, chefs, braaimasters, Mommies across the globe, Axhilirit© has been used on every continent. We currently have clients in 35 Countries. 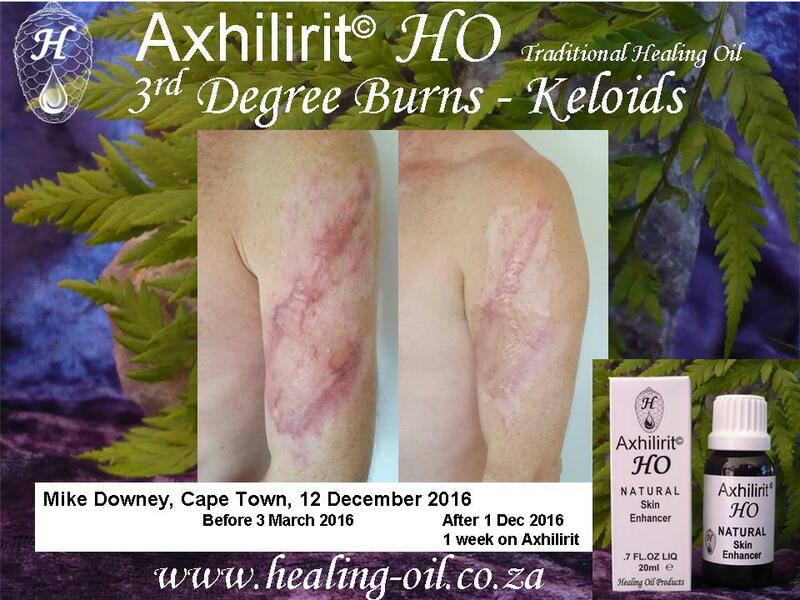 Always keep a handy supply available in your travel-bag, the kitchen, at the braai, in the car, in your pocket when out on excursions as First Line Treatment for any broken, scraped or blistered skin. "Thank you!! I'm so grateful!!" Below is a synopsis of my story… for your Blog. On 4 September 2015 I was involved in a petrol fire in which I sustained 3rd degree burns to my left arm and hand, right lower arm and wrist, upper chest, left side of my neck and my entire left ear, 2nd degree to the rest of my neck, and 1st degree to my face, with small 3rd degree spots on my lips, nose and neck. 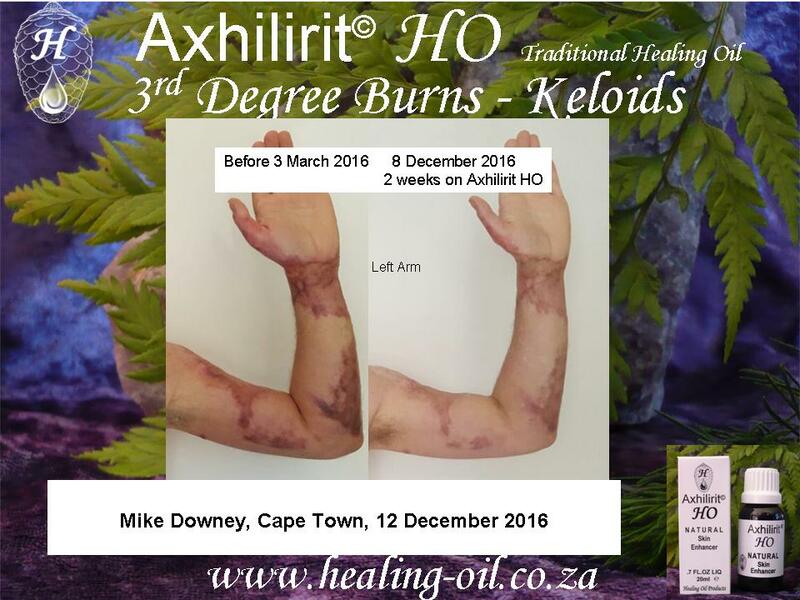 I spent 18 days in high care at Durbanville Mediclinic where I received fantastic care, which included a carpal tunnel release on the 4 September, and a skin graft from my left leg onto my left arm on 11 September. The reason for not grafting my right arm, chest and neck was that I lost too much blood during the first grafting session and I needed to recover first after receiving 5 units of blood post-op. My grafts all took well and by the time I was able to undergo an additional grafting procedure, my outstanding burns had shown such remarkable recovery that is was decided to allow them to continue to heal naturally. I have keloid skin in the family on my mother’s side. 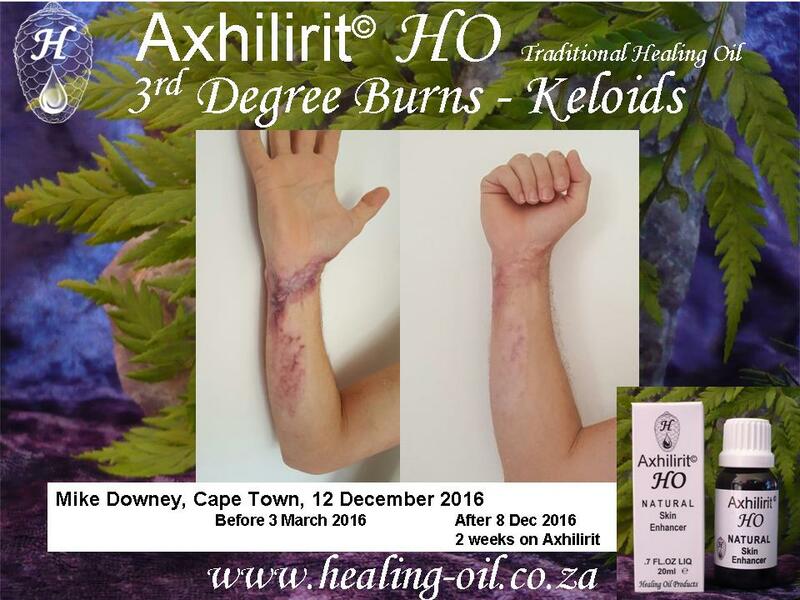 Soon after all the open wounds had closed up in October 2015, signs began to show that some keloids were growing. Western medicine only has 2 treatments: cortisone (with all of its associated complications and risks) and pressure garments. I wore pressure garments on my left arm and hand and right lower arm and wrist from December 2015. I was told about Axhilirit HO in January 2016, but was advised by my Occupational Therapist to not use anything other than aqueous cream. I should NOT have listened to her! You will notice from the available pics that my keloids have grown substantially since March, particularly the ones on my neck, below my ear and on my cheek. These were much redder too. 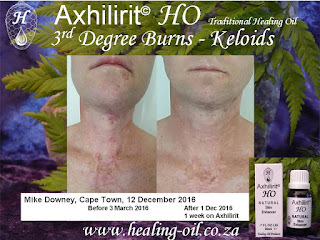 There is evidence that the pressure garments helped reduce the growth of keloids, as the thickness of the keloids that were covered by the pressure garments are much thinner and flatter than the areas where I could not wear them, like my shoulder, chest and neck. I could not leave the pressure garments off for more than 20 minutes a day without it feeling like the blood pressure in my arms and hand was going to burst through my scarred skin. On 23 November 2016, the same colleague who told me about Axhilirit HO oil eleven months earlier, brought me a small amount to try. I was quite despondent after seeing so little improvement in the last 6 months that I decided to try it. 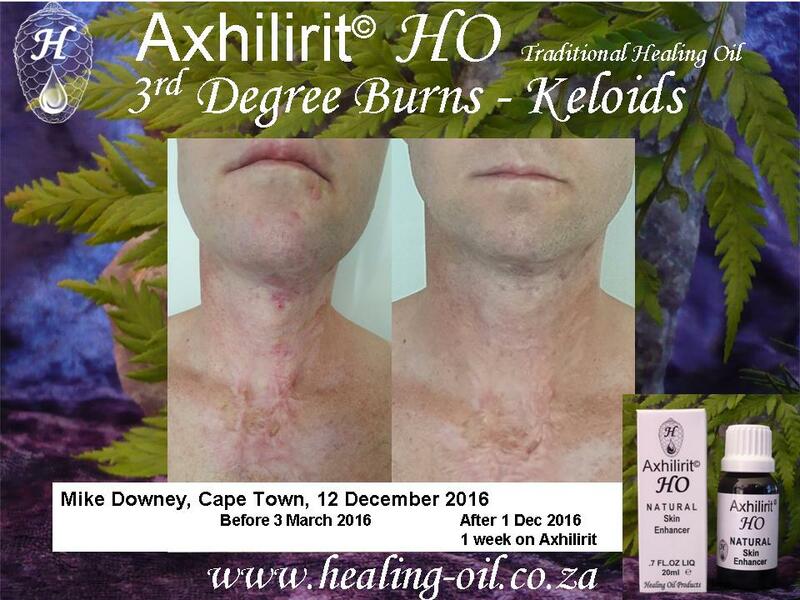 My keloids had already grown anyway, my itching scars were driving me insane and I hated the necessary discomfort of the pressure garments. How much worse could it be? 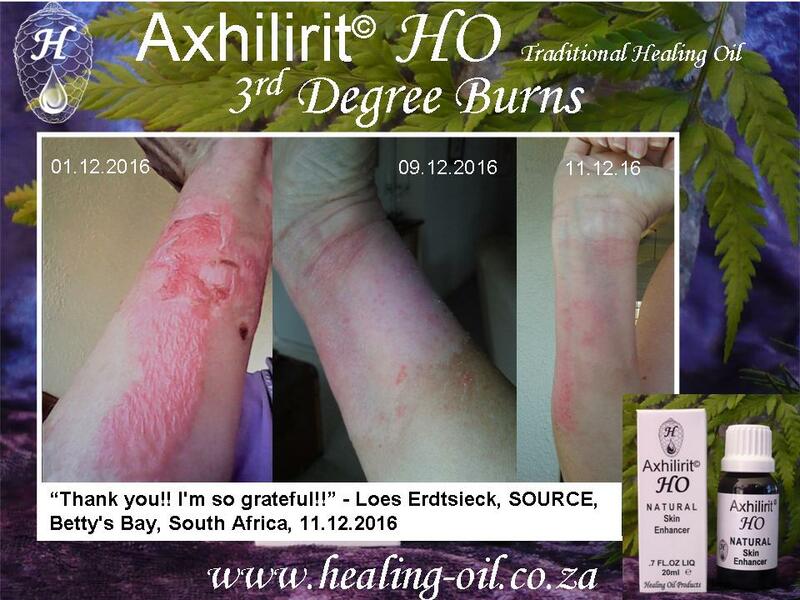 I started using the Axhilirit HO oil on 23 November 2016. I experienced immediate relief from itching and improved elasticity, so I went out and bought some more. Sunday 27 November 2016 was the last time I wore a pressure garment. I was able to leave all of them off without the usual blood pressure discomfort and pain referred to above. On 2 December 2016 I started using the Axhilirit HO ointment in conjunction with the Axhilirit HO oil, as this tends to keep the skin supple and moisturised for longer. Today being 12 December, 19 days after starting to use the Axhilirit HO products, I am still enjoying daily improvements in the colour, texture, elasticity of all my burn scars and keloids. The nail bed on my thumb sealed up for the first time in 15 and a half months, just 3 days after starting to use Axhilirit HO oil. My hand’s dexterity is improving and the sensitivity of the scars is reducing. The swelling in all of the keloids, including the ones on my chest, neck, cheek and shoulder, is reducing and the colour is improving. I have great anticipation for further healing at this pace and would recommend Axhilirit HO products to anyone who has similar issues.